Please, do contact us via the contact form. and legal notice in the site notice. 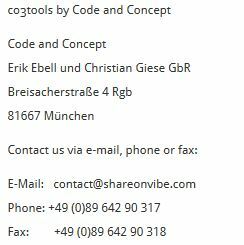 To receive Code and Concept’s newsletter with news and information from ShareOnVibe simply add your name and email below.